Traverse Magazine’s Upper Peninsula correspondent Aaron Peterson takes us on a bike ride along Copper Harbor’s bike trails, revered nationally by bikers, and includes lots of tips for getting the most out of your trip. Mountain bikers across the nation are heaping lodes of love on Copper Harbor’s curvaceous new trails. To ground-truth the ride, intrepid reporter, photographer and bike addict Aaron Peterson rolls with the local trail savant who took the system to the top. Fragments of ground and gravel from Copper Harbor’s On the Edge mountain bike trail are ricocheting through the roulette wheel of my blurring spokes, careening flecks of light in the slanting rays of dawn before they spit a few feet to the right and fly off into a shadowy free fall down the unforgiving face of Brockway Mountain. I’m in Copper Harbor riding because I’ve heard good things are happening. There’s a buzz you can feel, and a momentum behind the bike scene that makes it seem destined for greatness. It’s a feeling I imagine Moab, Bend or Whistler had at one time when the local scene was about to become significantly less local. Much of the hum emanating from this shy Lake Superior harbor town seems to swirl from a smart, quiet and hardworking guy named Aaron Rogers and the rapidly growing network of national quality bike trails he and the crew of the Copper Harbor Trails Club are laying down. On the Edge is one of those new trails and it’s living up to its name. 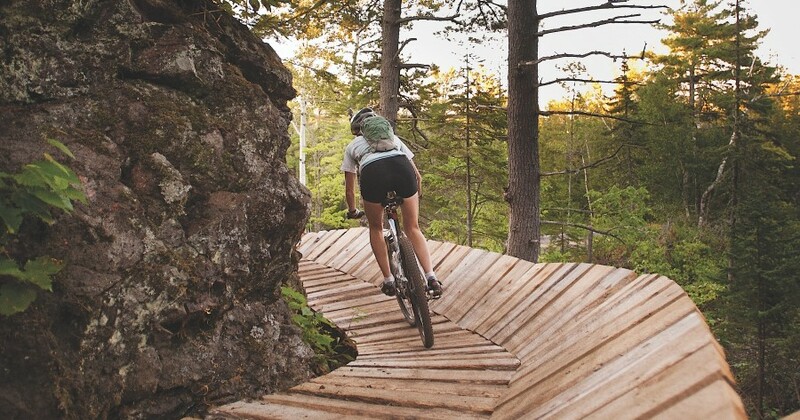 The flowing ribbon of silky singletrack deviously parallels a dramatic cliff edge above a panorama of pine-cloaked ridges just inland from Lake Superior here on the Keweenaw Peninsula. I’m hooking up with Rogers later for a tour of the new trails, but I decided first to knock some rust off the chain and get my bearings before pedaling with the guy that built the path. I’m trying not to think about how far the gravel falls as it pings over the cliff when all of a sudden the scary part is over, the trail bends away from the edge and back into the stunted oak and pine along this 1,200-foot-high ridge-top. I relax—but too soon it appears. The trail rounds a bend and S-curves through a sort of gnarly couloir via eight 180-degree switchbacks over what appears to be some sort of medieval wooden gravity-powered torture device masquerading as a trail. At the top, a young dude with a helmet cam tells me he calls it “the corkscrew.” His buddy calls it the “dragon’s tail.” I’m thinking maybe it could be dubbed the “centrifuge” because that is what I imagine it is going to feel like when I go rag-dolling off it in a few minutes. But fear turns to fun as my bike and I drop in and roll through it like a two-wheeled yo-yo yin-yanging back and forth down the mountainside, swooping, gaining speed, just trusting my tires and hanging on for dear life. At the end of the ride I wheel back into town. I can’t wait to meet Rogers. If this guy can build a trail that fun, that even a hack like me can ride, well then he must be as good as everyone says he is. For the uninitiated, the Keweenaw Peninsula is a 60-mile-long thumb-in-the-wind arcing northeast into the heart of Lake Superior from the western U.P. The village of Copper Harbor is all the way at the Keweenaw’s tippity tip, squeezed between the base of Brockway Mountain and the rocky Lake Superior shore. Setting my scene today is a guy jigging for whitefish off the harbor dock, a bell buoy tolling out on the big lake and a rattle-can-gold Toyota 4×4 with a driftwood bumper and carrying teepee poles and a canoe. About 80 folks live-and-let-live year round up here. They just call it “the Harbor.” It’s the sort of place I imagine Bob Marley would have found homey if he was into flannel shirts and berry picking. But the Harbor is also the sort of place that attracts people hell-bent on rolling the dice. Mount Bohemia, arguably the most extreme skiing in the Midwest, is just down the road. The wolves and mist-shrouded crags of Isle Royale National Park are just beyond the northwest horizon; a daily boat can take you. Mile upon mile of bony undeveloped coastline calls to kayakers. Heck, the only reason the town exists at all is because of the gutsy miners that came in the 1840s to try and claim their fortunes in copper during a mining boom that ultimately produced 10 times more mineral value than the California Gold Rush. So you see Copper Harbor is filled with people who are at once both get-up-and-go and sit-down-and-chill. Few embody that spirit more than Sam Raymond, the wiry, perpetually smiling owner of Keweenaw Adventure Company. Raymond settled in the Harbor in the mid-1990s after getting bit by the biking bug in Colorado. Many, many people have been involved in the care and feeding of the region’s trails, but Raymond’s name always is mentioned with reverence. He brought his love for biking to the region, meshed it with the passion of other local trail pioneers and began working with landowners and business owners to get biking accepted as a legitimate activity in the tourism-based economy. Today his shop is a hub of local outdoors knowledge where you can book a guided kayak trip, find a top-notch bike mechanic, rent a bike, or catch a ride on the new shuttle service. Raymond is the vice president of the trails club and serves as the race director for the club’s annual Copper Harbor Fat Tire Festival, a Labor Day weekend ritual with bike racing at its core and community in its heart. But one of the most important things Raymond may have done in the progression of Copper Harbor trails was to hire on a newcomer to the Harbor as a kayak guide, bike mechanic and general roustabout. In 2005 Aaron Rogers drifted north from Wisconsin to spend a post-college winter snowboarding at Bohemia. By the following summer he knew he was meant to build a life in Copper Harbor and was working at Raymond’s shop. Over the course of several years, Raymond, Rogers and a crew of volunteers hand-built trails through the rocky, rooty and largely vertical landscape that surrounds the Harbor. Check out this video to learn how to get the right fit for your bike. Then the gears started to click. They partnered with the International Mountain Biking Association, a bastion of low-impact sustainable trail building and advocacy. They formed the nonprofit trails club and jumped their budget from about $3,000 to over $100,000 through memberships, map sales, the annual race and a sponsorship donor program. By 2009 the trails club had set Rogers loose in the woods as a full-time paid trail builder, and by 2010 they’d given him an assistant and $30,000 in excavating machinery. Copper Harbor, and Rogers, began to get a reputation for creating buttery smooth, purpose-built singletrack. Rogers and I are bouncing up the pockmarked paved road to the top of Brockway Mountain in his mostly scratch-built 80s’ Toyota 4×4 (rattle-can black). At 30, he’s brawny, a little scruffy and maybe even shy, but with a quiet confidence. There are about 27 miles of trails in the Copper Harbor network, but the one he’s about to introduce me to is his baby. It’s the latest addition, finished only recently and simply named The Flow. Flow is an elusive mountain biking concept that is hard to define without using the word “flow.” It is just a fluid feeling a good trail has, where a rider can maintain speed, be smooth and yet still challenged, but not so much it kills the buzz. Most important to Rogers, flow means having fun. The comforting little blue trail marker sign says The Flow is an intermediate trail, but we’re at the top of a mountain, and I know the trail ends at the bottom, and honestly I’m a little freaked about the slant that lies in between. No time for that though, Rogers is clicked in and gone. The Flow you are immediately met with Rogers’s handiwork as you switchback through a maze of perfectly linked corners that are banked up in a way that keeps the whole ride smooth and … flowing. The ride goes on and on for just over three miles down about 600 feet of vertical. Rogers is just a speck ahead of me, cranking on the pedals, pumping speed out of the trail and high-marking on the bermed corners before swooping down into the next straightaway-corner combo. I’m lollygagging, taking it just fast enough to have fun, but slow enough to get a good look at the terrain, when the trail busts out on a ledge overlooking Lake Superior. The frigid blue hugeness of the scene takes my breath and sweat away simultaneously. The Flow trail ends near a feature called The Castle. This is where Rogers and the trails club really get impressive. They don’t just build trails in the woods, they can conjure them out of thin air. The Flow trail had a problem—it ended in midair on the side of a rocky outcropping with about 40 vertical feet left to get riders down to street level. Rogers hatched a plan. He and his crew cut rot-resistant dead standing cedar trees, milled them into timbers and planking at a local contractors sawmill, and then built an arced ramp to partially descend the face. Then, over the course of a week and a half, they built a rock-and-sand turret like a layer cake up the rock face to meet the ramp; The Castle was born. Rogers intends to further squeeze fun out of the Copper Harbor terrain in coming years. He envisions a 35-mile cross-country loop out to the wilderness shoreline of MDNR lands on Keweenaw Point. He’s mapping extreme dirt-jump gravity trails, planning refinements to the club’s older hand-built trails that are showing their age. In 2010 IMBA tagged the Copper Harbor trails with its coveted Epic Trail status, essentially promoting them internationally on a bucket list of the best rides in America. Most recently IMBA honored Copper Harbor’s spirit and diversity of trails by designating it one of six national Ride Centers. Local businesses are taking note too. Shop owners are putting in bike racks. Restaurateurs are dreaming up healthier menus. A craft brewery is scheduled to open in early 2012. Bike the Keweenaw has good info on additional trails in the region,local bike shops and more. bikethekeweenaw.com or copperharbortrails.org. Crystal Mountain has a stout renown for its skiing, golf and spa, but mountain bikers need to know it sits within striking distance of some of the premier singletrack in the Lower P. 800.968.2911, crystalmountain.com. Crystal Mountain: On site Crystal maintains 12 miles of mountain biking trail. Steep climbs and descents near the lodge, flatter ground out back. Connects to 8 miles of riding on the Betsie River Trail. Arcadia Bluffs Trail, Arcadia: One of the most well constructed trails in Northern Michigan. Plenitude of ascents and descents; expert berming keeps the flow flowing. 11 miles of trail. 15 minutes west of Crystal. M-22 to St. Pierre Road, 3 miles north of Arcadia. Shoreside and right downtown in the tiny but alluring burg of Boyne City. All units are one-bedroom suites. Enticing restaurant selection (Red Mesa Grill, Café Sante, others) within walking distance. 231.582.3000, boynewaterstreetinn.com. Boyne Mountain Resort Trails: No surprise that Boyne Mountain, one of the Midwest’s highest profile ski resorts, boasts a rockin’ rollercoaster of a mountain bike trail. 12 miles of single-track woven through ski hills that made the mountain famous. Boyne Mountain Resort is on U.S. 131 just south of Boyne Falls. 231.549.6000, boyne.com. Avalanche Preserve Recreation Area, Boyne City: Another former ski hill, and trail designers make you aware of the park’s former career. A thoughtfully mapped out and well maintained (and challenging) 6-mile loop. Out-and-back makes it 12 miles. At summit, a glorious vista of Lake Charlevoix. In Boyne City. 231.582.6597, gov.boynecity.com. To see this article accompanied with awesome photos of Copper Harbor’s mountain biking trails, order a copy of Traverse, Northern Michigan’s Magazine’s April 2012 issue.